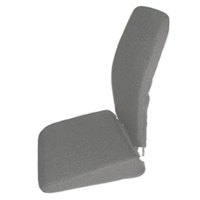 Sacro-Ease Seat Supports from McCarty's Sacroease were initially designed over 70 years ago to "rebuild" the support that is lost as seat cushioning and supporting structures age. 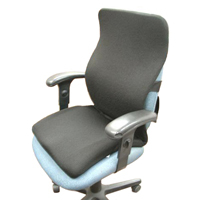 They also serve well to improve the functionality of low cost office chairs or uncomfortable mass transit seating. Built to outlast and outperform other available solutions, all models of the Sacro-Ease Seat Supports feature the same foundation that has always set them apart from other available options. A 1/8" thick by 1" wide steel band frames both the seat and back of the supports, with a steel folding hinge at the rear of the seat. Over these frames are stretched rubber bands that serve to absorb vibration when travelling over rough terrain or to provide a cushioning resistance when sitting on seats that are no longer as supportive as they once were. The steel frame is bendable which enables users to adjust the lumbar curvature and position to provide themselves with optimally-placed support. The Deluxe Sacro-Ease Seat Support features the primary steel base and rubber band structure with a cover of high quality durable upholstery. 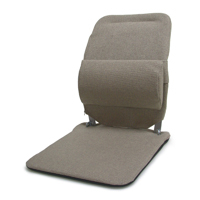 The seat portion is padded with a 1" layer of standard poly foam and features a durable, non-skid bottom that keeps the Sacro-Ease firmly in place on all seats. It is stocked in the standard 15" seat width but is also available by Special Order in a 12" width that works with narrower bucket seats or a 19" width for bench seats or larger users. Deeper seats are also available by Special Order. A convenient handle facilitates transport between locations when the seat support is folded. The Deluxe model is intended for use where both shock absorbance and comfort are being considered. The cushioning effect of the stretched rubber band is supplemented by the additional 1" thick layer of poly foam cushioning. The back features a curved foam lumbar pad that is easily adjusted to any height along the back and can be used to enhance and provide cushioning over the lumbar curve of the steel frame. Please Note: There is no foam padding in the back of this model, only on the seat and in the foam lumbar pad. The Sacro-Ease Ergo Wedge (formerly the Wedge Ease) from McCarty's is designed to improve back alignment. The wedge shape elevates the hips in relation to the knees and in doing so tilts the pelvis forward. The forward tilt of the pelvis assists the spine in returning to its correct alignment. The Ergo Wedge is effective in reducing or eliminating the slope common to vehicle seats by filling in this space and elevating the user. The cushioning effect of the seat also has the potential to reduce impact to the spinal discs when sitting down on a hard seat or travelling on rough roads. The Ergo Wedge tapers from 3" at the back to 1" at the front and features a wedge-shaped poly foam base with a 1" comfort memory foam upper layer. A removable insert in the tailbone area accommodates the needs of users who require this type of pressure relief. The soft fabric cover is removable and fully washable. The McCarty's Keri Back Sacro-Ease Back Support is built to provide the highest possible levels of comfort and support. The steel frame provides strength, durability, and versatility that plastic structures are incapable of achieving. Wide rubber bands that are stretched over the frame to provide shock absorbance and cushioning also serve as a resilient foundation for the top layer of cushioning. The front of the Keri Back features a 1" thick layer of high quality Comfort Memory Foam that ensures the ultimate in comfort, easily contouring to the body while still providing the necessary support. The steel frame on the Keri Back can be carefully bent by hand, permitting users to increase or reduce the degree of lumbar support as desired. As well, the shape of the Keri Back will accommodate users of all builds as, unlike many other back supports, there are no "wings" that curve forward at the sides. The combined cushioning effect of the rubber bands and Comfort Memory Foam provides comfort of a much higher degree than that of traditional foam or polyurethane foam. The breathable fabric cover also ensures hours of comfort while sitting. The Keri Back can be used at work, in office chairs, at home on the couch, or in the car. The strapping system is easily adjustable to secure in place after it is positioned. Straps can be either horizontal or vertical, simply choose the desired configuration. The vertical straps are perfect for those with seats that are too deep or concave for the traditional horizontal straps and also aid in positioning the Keri Back at the optimum height. A convenient carrying handle facilitates easy movement between locations. The Cutout Sacro-Ease Seat Support features the primary steel base and rubber band structure with a cover of high quality durable upholstery. 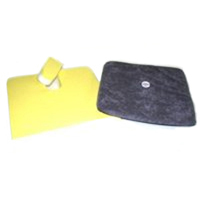 The modified seat portion is padded with a 1" layer of standard poly foam but features a 2.5" wide x 9" deep "foam-free" Coccyx cutout that provides pressure relief for those suffering from tailbone injuries or other conditions that generate similar sensitivity to pressure. The underside of the seat is a durable, non-skid material that keeps the Sacro-Ease firmly in place on all seats. It is stocked in the standard 15" seat width but is also available by Special Order in a 12" width that works with narrower bucket seats or a 19" width for bench seats or larger users. Deeper seats are also available by Special Order. A convenient handle facilitates transport between locations when the seat support is folded. The Cutout model is specifically designed for applications where pressure on the Coccyx needs to be reduced. The cushioning effect of the stretched rubber band is supplemented by the 1" thick layer of poly foam cushioning with the pressure relief being offered by the coccyx zone cutout. Those who have a higher degree of sensitivity may derive greater benefit from one of the other SacroEase Seating options that feature thicker or different types of foam. The back features a curved foam lumbar pad that is easily adjusted to any height along the back and can be used to enhance and provide cushioning over the lumbar curve of the steel frame. 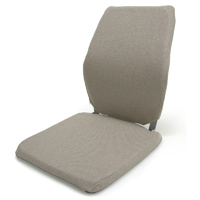 The Memory Foam Sacro-Ease Seat Support features the primary steel base and rubber band structure with a cover of high quality durable upholstery. The seat and backrest are both padded with a 1" layer of high quality Visco-Elastic Comfort Memory Foam that offers superior cushioning and vibration damping. The Memory Foam also contours to the body to aid in reducing potential pressure points. The underside of the seat features a durable, non-skid bottom that keeps the Sacro-Ease firmly in place on all seats. It is stocked in the standard 15" seat width but is also available by Special Order in a 12" width that works with narrower bucket seats or a 19" width for bench seats or larger users. Deeper seats are also available by Special Order. A convenient handle facilitates transport between locations when the seat support is folded. The Memory Foam model offers a superior level of both shock absorbance and comfort. The cushioning effect of the stretched rubber band is superbly supplemented by the additional 1" thick layer of Comfort Memory Foam cushioning. The Standard Sacro-Ease Seat Support is the most basic model of this line of products. It features the primary steel base and rubber band structure with a simple cover of high quality durable upholstery. The cover is zippered for ease of removal and is washable. The seat features a durable, non-skid bottom that keeps the Sacro-Ease firmly in place on all seats. It is stocked in the standard 15" seat width but is also available by Special Order in a 12" width that works with narrower bucket seats or a 19" width for bench seats or larger users. Deeper seats are also available by Special Order. A convenient handle facilitates transport between locations when the seat support is folded. This basic model is intended for use where shock absorbance is the key concern, with the stretched rubber bands acting as the sole source of cushioning. The back features an adjustable curved foam lumbar pad that is easily adjusted to any height along the back and can be used to enhance and provide cushioning over the lumbar curve of the steel frame. Please Note: There is no foam padding in either the seat or back of this model, only in the foam lumbar pad. The Cutout Sacro-Ease Seat Support features the primary steel base and rubber band structure with a cover of high quality durable upholstery. 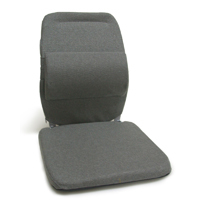 The modified seat portion is padded with a combined 1" thick layer of foam (comprised of a half-inch layer of Comfort Memory Foam over a a half-inch layer of standard polyfoam) and features a 2.5" wide x 9" deep "foam-free" Coccyx cutout that provides pressure relief for those suffering from tailbone injuries or other conditions that generate similar sensitivity to pressure. The back rest features a full 1" of Memory Foam. The underside of the seat is a durable, non-skid material that keeps the Sacro-Ease firmly in place on all seats. It is stocked in the standard 15" seat width but is also available by Special Order in a 12" width that works with narrower bucket seats or a 19" width for bench seats or larger users. Deeper seats are also available by Special Order. A convenient handle facilitates transport between locations when the seat support is folded. This Cutout model is specifically designed for applications where pressure on the Coccyx needs to be reduced. The cushioning effect of the stretched rubber band is supplemented by the 1" thick layer of combined memory foam and poly foam with the pressure relief being offered by the coccyx zone cutout. The Memory Foam Tapered Seat Sacro-Ease Seat Support offers the highest degree of cushioning and comfort of any Sacro-Ease product. The wedge-shaped seat is designed to "fill" the dip that exists at the rear of many auto and truck seats. The tapered seat design also offers ergonomic benefits by elevating the hips which in turn helps to tilt the pelvis forward and restore the natural C-Curve of the spine. When correctly aligned the spine is able to better absorb impact and is also less susceptible to injury. As with other Sacro-Ease models, the tapered seat version includes the primary steel base and rubber band structure with a cover of high quality durable upholstery. The backrest is padded with a 1" layer of high quality Visco-Elastic Comfort Memory Foam that offers superior cushioning and vibration damping. The Memory Foam also contours to the body to aid in reducing potential pressure points. The wedge-shaped seat tapers from 1" thick at the front to 3" thick at the rear. 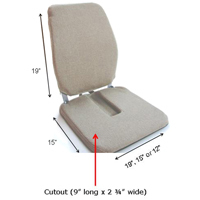 The seat cushion is comprised of two layers, the upper being a 1" layer of Comfort Memory Foam (the same as the backrest), with an underlying wedge of high density poly foam that tapers up to 2" thick at the rear. The combined rear thickness of 3" is ideal cushioning for applications where extremely rough conditions are experienced. The underside of the seat features a durable, non-skid bottom that keeps the Sacro-Ease firmly in place on all seats. A convenient handle facilitates transport between locations when the seat support is folded. It is stocked in the standard 15" seat width but is also available by Special Order in a 12" width that works with narrower bucket seats or a 19" width for bench seats or larger users. Deeper seats are also available by Special Order. Note: If this Sacro-Ease Seat Support is to be used in a vehicle with limited headroom please be aware that even when compressed this seat could elevate the user up to 2". The Sacro-Ease Super Deluxe 2000 Seat Support is designed specifically for use on vehicle seats, especially narrow buckets with limited space between the side bolsters on the seat and back. As seats age it can become very easy to slouch into them, with the back rounding out to a C-Curve that can put extreme load on the lower back. The Super Deluxe 2000 model "fixes" the sagging by providing a support that no longer "sags". The hinged steel frame keeps users firmly positioned in a correct upright posture. By adjusting the curve of the frame to optimize the lumbar support each user can customize the seat support to meet their specific needs. 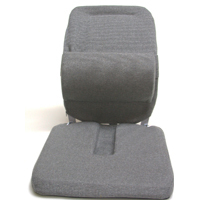 A height adjustable lumbar pad can be used to further enhance the lumbar curve. The Super Deluxe 2000 model features the primary steel base and rubber band structure with a cover of high quality durable upholstery. 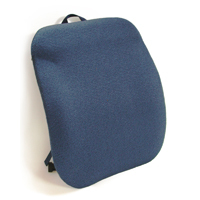 Both the seat and back rest are padded with a 1" layer of standard poly foam. The cushioning effect of the foam padding is enhanced by quilting that also creates a 3-D surface that is better suited to extended sitting than a flat surface. The seat features a durable, non-skid bottom that keeps the Sacro-Ease firmly in place on all seats. The frame on the Super Deluxe 2000 is narrower than other stocked models —the seat is just 12" x 12"—so that it can fit between the bolsters on deeper or narrower bucket seats. The back rest frame is only 10.5" wide to ensure that it sits flush against the backrest on the narrowest of seats. 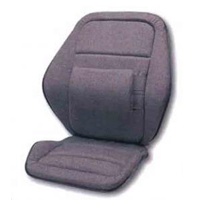 The quilted padded "wings" extend several inches past the frame on all edges to ensure a comfortable transition from Seat Support to bucket seat. A convenient handle facilitates transport between locations when the seat support is folded. Although the Super Deluxe 2000 model is designed specifically with automotive use in mind, it can be effective wherever support, shock absorbance, and comfort are being considered. Tired of sitting in terrible seats and getting up with a sore back? That can be a thing of the past with the Chair Makeover from McCarty's Sacroeasae. This unique product combines two products into a unique package. The seat is a specially contoured and molded Visco Memory Foam (17" W X 16" D) designed to optimize your sitting comfort while the 24" H X 17" W back is designed with the same bendable steel frame, rubber webbing and Memory Foam as the Sacro-Ease Memory Foam Seat Support. Over all this there is a soft and flexible fabric covering available in a wide range of designer colours. The 24" high back enables you to custom bend the back to provide yourself with the lumbar and shoulder support that you require and provides a level of support not found in many office chairs. Like other Sacro-Ease Seat Supports, the Chair Makeover has a handle to enable you to transport it between locations and, also like other models, can be used in virtually all seating situations to vastly improve the back support which is so often lacking.